The Nigerian state governors 2011–2015 term formally begins in May 2011 for the 26 state Governors in Nigeria elected in April 2011. In the 10 other states, elections were delayed until the current incumbent had served their full term. Governors are normally elected for a four-year term during the national elections in which the President and members of the upper and lower house are also elected, as are the state legislators. In some cases, the first officeholder may be replaced by another, for example through death, impeachment or if an election is annulled. Elections for 24 of the 36 states in Nigeria were held on 26 April 2011. In the northern states, elections were held in an atmosphere of violence that followed the election on 16 April 2011 of the southerner Goodluck Jonathan as President. Elections were delayed until 28 April in Bauchi and Kaduna states due to violence between Christians and Muslims. Turnout in these states was low when the elections were held. Initial results for 12 states were announced on 28 April 2011, with seven governors being reelected and five governors elected for the first time. Later that day, results for 22 of the states had been declared, of which the People's Democratic Party (PDP) had taken 15. The Independent National Electoral Commission (INEC) declared the election in Imo state "inconclusive" due to irregularities in collation of results. On 29 April the INEC decided to hold supplementary polls in four local government areas and one ward in Imo State on 6 May 2011 to decide the election. Elections for the 10 remaining states were to be held only when the four-year tenures of the current governors run out. The governors of Adamawa, Anambra, Bayelsa, Cross River, Edo, Ekiti, Kogi, Ondo, Osun and Sokoto states had served less than four years due to taking office only after nullification of the election of former incumbents. Following is a list of all Nigerian state governors who held office during the 2011-2015 term. Acting governors are not shown. ^ a b Sulaimon Olanrewaju and Olayinka Olukoya (28 April 2011). "GOV ELECTION: The winners are Ajimobi, Fashola, Amaechi, Amosun, Abdulfatah, Akpabio, Aliyu, Dakingari, Orji, Chime, Kwankwaso..." Nigerian Tribune. Archived from the original on 30 April 2011. Retrieved 28 April 2011. 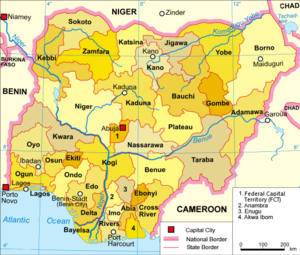 ^ "Nigeria: governor elections press ahead amid killings". The Guardian (UK). 26 April 2011. Retrieved 28 April 2011. ^ Jon Gambrell (28 April 2011). "Nigeria carries out delayed gubernatorial elections in 2 states where churches, mosques burned". The Associated Press. Retrieved 28 April 2011. ^ Elisha Bala-Gbogbo and Ardo Hazzad (28 April 2011). "Nigeria's Ruling PDP Party Takes More Than Half of Governor Races Declared". Bloomberg. Retrieved 28 April 2011. ^ BEN AGANDE, LUKA BINNIYAT & SUSAN EDEH (30 April 2011). "INEC extends Ohakim, Rochas' battle". Vanguard. Retrieved 29 April 2011. ^ Oziegbe Okoeki (29 April 2011). "How Assembly polls filled the void in 10 states". The Nation. Archived from the original on 27 July 2011. Retrieved 29 April 2011. This page was last edited on 30 October 2018, at 10:11 (UTC).